Information on emergency orthodontic care for problems with braces: food caught in braces, soreness or discomfort, loose brackets, wires or bands. The following orthodontic emergencies and their treatments are listed in the order of the least severe to the most severe. Only the most severe emergencies may require immediate attention by an orthodontist. The majority of these are easily treated with a follow-up visit with Dr. Halberstadt. A. Ligature - The archwire is held to each bracket with a ligature, which can be either a tiny elastic or a twisted wire. B. Archwire - The archwire is tied to all of the brackets and creates force to move teeth into proper alignment. 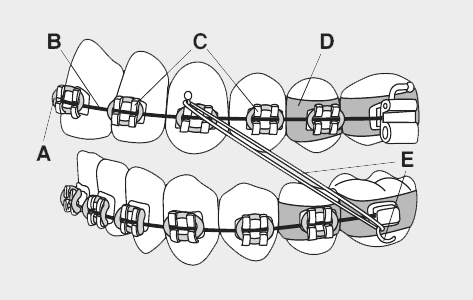 C. Brackets - Brackets are connected to the bands, or directly bonded on the teeth, and hold the archwire in place. D. Metal Band - The band is the cemented ring of metal which wraps around the tooth. E. Elastic Hooks & Rubber Bands - Elastic hooks are used for the attachment of rubber bands, which help move teeth toward their final position. This is not an emergency, but can be a little uncomfortable or embarrassing for the braces wearing patient. It is easily fixed with a piece of dental floss. Try tying a small knot in the middle of the floss to help remove the food, or use an interproximal brush or toothpick to dislodge food caught between teeth and braces. Tiny rubber bands or small, fine wires, known as ligatures, hold the wire to the bracket. If a rubber ligature should come off, you may be able to put it back in place using sterile tweezers. If a wire ligature comes loose, simply remove it with sterile tweezers. If the wire ligature is sticking out into the lip but is not loose, it may be bent back down with a Q-tip or pencil eraser to eliminate the irritation. Of course, when one ligature pops off or breaks, others may follow. Be sure to examine all ligatures. Missing or broken ligatures should be brought to the attention of Dr. Halberstadt. Occasionally, the end of a wire will work itself out of place and irritate the patient’s mouth. Use a Q-tip or pencil eraser to push the wire so that it is flat against the tooth. If the wire cannot be moved into a comfortable position, cover it with relief wax. (See Irritation of Lips or Cheeks above for instructions on applying relief wax.) Please make Dr. Halberstadt aware of the problem. In a situation where the wire is extremely bothersome and the patient will not be able to see the orthodontist anytime soon, you may, as a last resort, clip the wire. Reduce the possibility of the patient swallowing the snipped piece of wire by using folded tissue or gauze around the area. Use a pair of sharp clippers and snip off the protruding wire. Relief wax may still be necessary to provide comfort to the irritated area. If the braces have come loose in any way, you should call our offices to determine appropriate next steps. Brackets are the parts of braces attached to teeth with a special adhesive. They are generally positioned in the center of each tooth. The bracket can be knocked off if the patient has eaten one of those hard or crunchy foods orthodontic patients are instructed to avoid, or if the mouth is struck while at play. (We encourage all patients, especially those with braces, to wear a protective mouth guard while playing sports.) If the bracket is off center, the adhesive may have failed. Please call our office immediately as Dr. Halberstadt will determine the next course of action.